As I type this, Atlantis is travelling over 15,000 miles an hour at the 8-minute mark of the historic last flight of the Space Shuttle program. The space shuttle engine just cut off – and will never fire again. 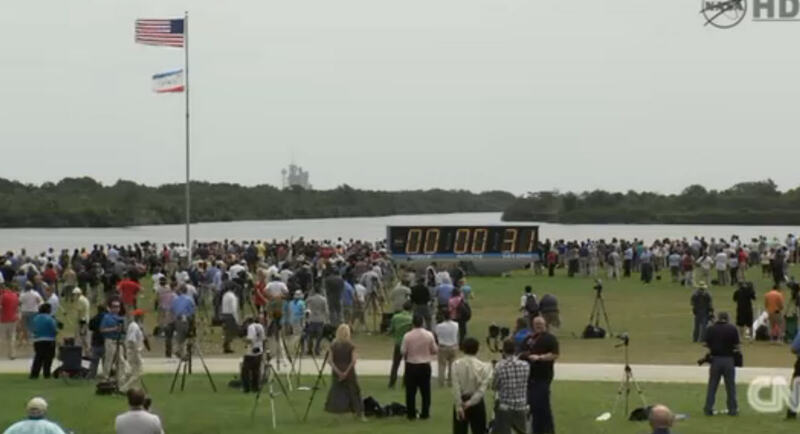 I view this launch with mixed feelings, as I am sure most of America and the world does as well. I grew up with the space shuttle program and it was the NASA I knew and understood. I was born just a tad too late for Apollo. On Sunday April 12, 1981, at exactly 7 :00am, I was sitting at home, getting ready for church, less than five miles away from the launch pad, when Columbia launched on STS-1. My dad was stationed at Patrick Air Force Base in Cocoa Beach and I was just barely 11-years-old. I remember being afraid as the windows started rattling and rushing outside to see the launch. From that point on I was hooked on NASA. Here is a video of that first launch of STS-1. Anything was possible – we were sending men into space in a reusable launch vehicle. It took off like a rocket and landed like an airplane. It was just the beginning of America’s continued leadership in manned spaceflight and exploration of our solar system. I wanted to be an astronaut. I purchased every astronomy magazine and cut out the pictures of stars, planets, nebula, spacecraft, and NASA-related images. I plastered my entire wall with these images – hundreds of them – and I would sit and stare, and dream, at them for hours at a time. I was a 15-year-old young man on January 28, 1986 when the Challenger exploded. I had stayed out of school that day for an early morning dentist appointment. We had moved from Cocoa beach to Orlando by that time, but every launch was still clearly visible from our house. My dad and I were on our way back home from the dentist listening to AM radio (because that’s all Dad ever listened to) when we heard the launch. We pulled over to the side of the road just as we had entered our sub-division to watch the launch. I remember knowing, instantly, what had happened when I saw the shuttle explode. We rushed home to watch the news and I remember crying for hours – my heroes were killed. That was my first experience with the “media frenzy” that is the norm today – hour upon hour of repeated and continuous coverage of te same thing with little or no new details emerging. Here is a video of that tragic moment. On February 1, 2003, I was a 32-year-old man living in Orlando with two young children who were both NASA nerds like myself; I had passed the joy, awe, and wonder of space travel on to both of my boys. They had crawled into bed with me and we were watching the re-entry on TV when, at 9:00am, the shuttle disintegrated. My oldest son started crying; his heroes had been killed. I knew exactly how he felt and I too wept, as much for his lost innocence as the astronauts who died. Here is a video of that disaster. I grew up with the success and tragedies of the Space Shuttle program. Because of Challenger, I KNEW space exploration was dangerous and I held my breath every time the shuttle launched. I was saddened by the fact that so many people considered space travel so mundane that they didn’t even watch the shuttles launch anymore. The space shuttle had brought space travel to the masses, had made it ordinary. And public interest lagged in the entire program until and unless there was a tragedy. Now here I am, a 41-year-old man and I just watched the last launch of the Space Shuttle program. 30 years of my life has been defined by NASA and the space shuttle program. This is a bittersweet moment for me. If you were to walk into my house, you would see all sorts of NASA paraphernalia. I have autographed pictures from Alan Bean, the late Wally Shirra, Buzz Aldrin, and more. I have 20+ astronaut autographs, mission patches, watches, etc – all commemorating NASA and our space program. The “NASA wall” I had as a kid still exists, but in a more mature form now – autographed pictures, memorabilia, posters, stamps, coins, and books. There’s no doubt that the shuttle program was a “magnificent failure” as former astronaut Duane Carey told the media. Of the five shuttle built, two were destroyed. Of the planned 50 launches a year we barely managed 9 at the best of times. As a way of keeping costs down through the use or reusable launch vehicles, it failed. The shuttle is the most complicated and expensive piece of equipment ever built – and the support structure for it crippled NASA from funding other projects for decades. It was the first of 3 steps Nixon era scientists saw as a ways to put a man on Mars – a dream never fulfilled or realized. The space shuttle stifled any research and exploration that wasn’t near-earth based. The shuttle became a bus that went 220 miles in a trip. We stopped looking to the stars while the shuttle was ferrying passengers up and down. And yet it cannot be said that the program was a complete failure. It brought the nations of the world together. Many, many scientific discoveries were made. We sent ambassadors, teachers, and representatives from all over the world into space on the shuttle. We built a space station. We furthered medical research immensely because of the shuttle. I am sad that, for the first time since the birth of our space program, America doesn’t have a way to get astronauts into space. We’re relying on Russians to get us there now. We have given up manned spaceflight supremacy. Is this a sign? Have we given up on manned space flight? Will we ever see the moon again? Will we ever walk on Mars? I am nervous about the future of our space agency. I have friends who work at NASA and they are now looking for jobs. The economy isn’t in the best spot. I agree intellectually that the space shuttle needed to be retired, but I did hope that we would have had a replacement program in place – and we don’t. So, NASA, what’s next?